High Quality Content by WIKIPEDIA articles! 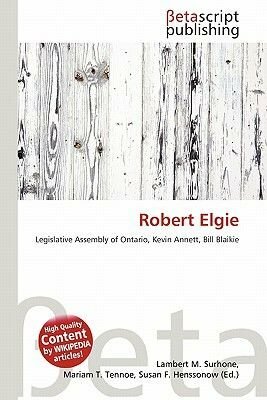 Robert Goldwin (Bob) Elgie (January 22, 1929) is a former politician in Ontario, Canada. He served in the Legislative Assembly of Ontario from 1977 to 1985, and was a cabinet minister in the Progressive Conservative governments of Bill Davis and Frank Miller. His father, Goldwin Elgie, was also a Conservative Ontario MPP in the 1930s and 1940s. He has chaired the Ontario Press Council since 2006. Elgie was born in Toronto, Ontario, and was educated at the University of Toronto, the University of Western Ontario, Osgoode Hall Law School and the University of Ottawa. He trained as both a lawyer and neurosurgeon, and worked in the medical field before entering political life.